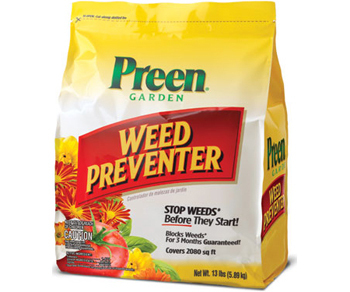 Garden Weed Preventer prevents summer and winter annual weeds from growing in flower and vegetable beds and around trees and shrubs for up to 3 months. Without weeds competing for sunlight, nutrients, and space, your plants will grow larger and stronger. Prevents new weeds from growing, it does not kill existing weeds. Works by creating a chemical barrier in the top 1 to 2 inches of the soil that prevents cell division in developing weed seeds. Active ingredients: 1.47% trifluralin. Other sizes available.